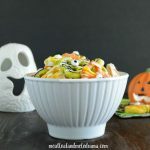 Have you ever made chow mein noodle haystacks before? I guess If you think about it, it’s kind of an odd combo — butterscotch, peanut butter and the crispy noodles. But the recipe does work, and they’re definitely tasty treats. I used to make the haystacks when my older kids were small, but it’s been a few years. Actually, since these are no-bake treats, I usually made them in the summer. But since it’s just about fall, I thought it would be fun to make them again. At first, the kids didn’t even know what these were. My middle child almost refused to try them because she thought the treats were made with pretzels, which she hates. But after they tasted the haystacks, the kids loved them! 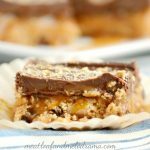 One of the best things about these no-bake treats is that you can make them in just a few minutes. 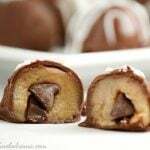 Just melt some peanut butter and butterscotch chips together, mix in the noodles, and drop tablespoon-sized balls onto a baking sheet lined with wax paper. You can make them round, almost like cookies, but if you arrange the mix so that the tops are narrower, you get a bunch of little haystacks. I thought it would be fun to add some candy pumpkin to the mix, so I pressed a pumpkin onto each stack. Then, I put the tray into the fridge to cool off. I wasn’t sure if the pumpkins would stick, but they did. And after a few minutes, the little mini haystack treats were firm enough to eat! By themselves, the treats aren’t that sweet, even though they contain the butterscotch chips. I think the peanut butter evens things out. 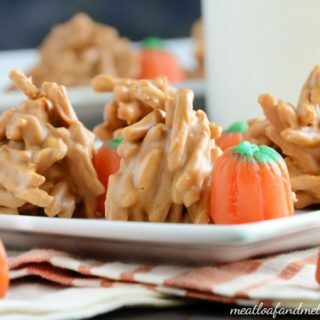 So, the candy pumpkins add a touch of sweetness to the haystacks, and it’s a nice mix of salty and sweet — one of my favorite combos! 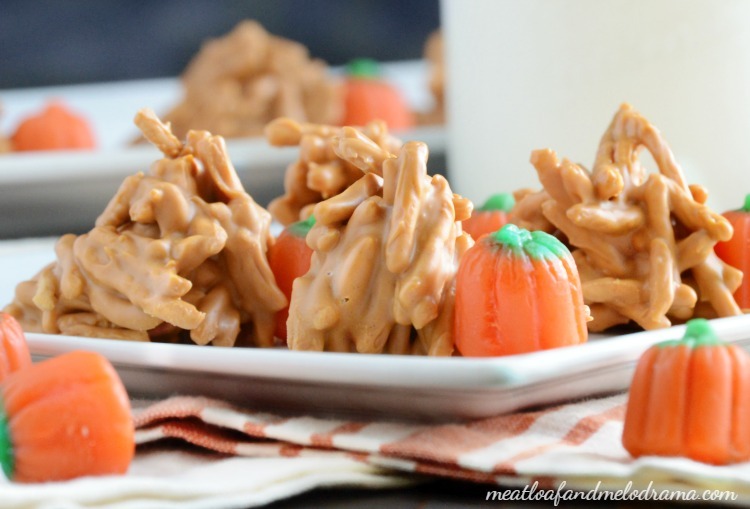 These butterscotch haystacks candy treats would be perfect for fall parties or just because. They’re quick and easy to make and definitely kid approved! It’s a fun way to celebrate fall, y’all. Sounds like a tasty combo! 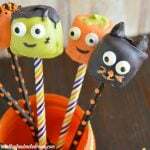 I could totally use these to decorate my Halloween cakes! These would be perfect for decorating, and that’s a great idea! How fun are these? 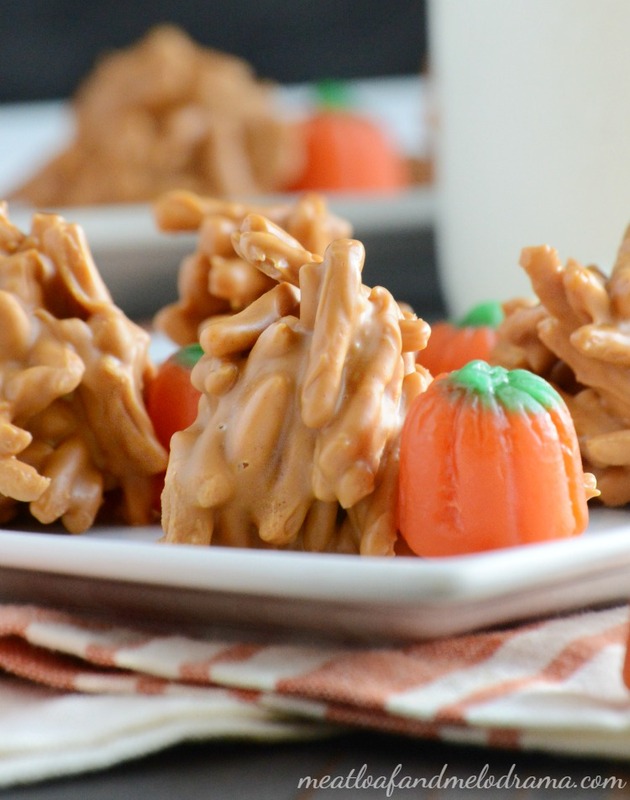 I can’t believe the season is to make these cute little haystacks. I’m with you there — time sure does fly! This is such a great childhood favorite! Also, I need to make a batch. Your photos make me crave these! Thanks, Anna. We have a few left — the kids really loved them! These are so fun! i remember having them as a kid, but don’t remember them being butterscotch. 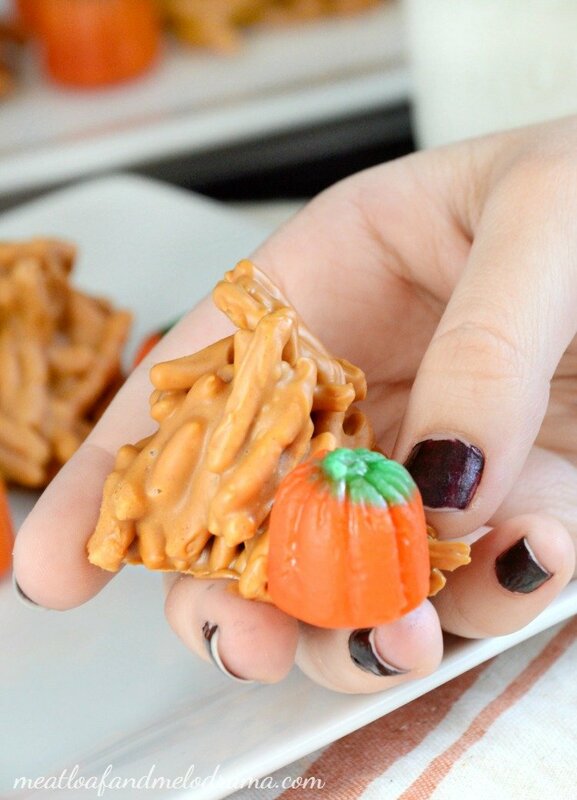 Super fun, and you’ve gotta love a no-bake treat! I think there are different variations out there, but I love butterscotch! Ahhhhhh… this is such a classic treat! 🙂 Love your fall twist! These are so cute! My kids would love to make them., I’ve never seen this before. I bet my kids would love these! We used chocolate morsels, pb and chow mein noodles to make bird’s nest this spring and they loved that. This would be a fun fall activity. Thanks for the idea. Pinned. Bird’s nests sound fun — I’ll have to remember this for spring! Love the addition of the pumpkin. Those look yummy and I love that you used chow mein noodles for that touch of salt! Thanks, Kimberly! It’s a great sweet and salty combo. We love Haystacks. My daughter makes them every year. I’ll have to show her yours. I like the pumpkins! Thanks, Shirley. When I saw the pumpkins, I had to add them! 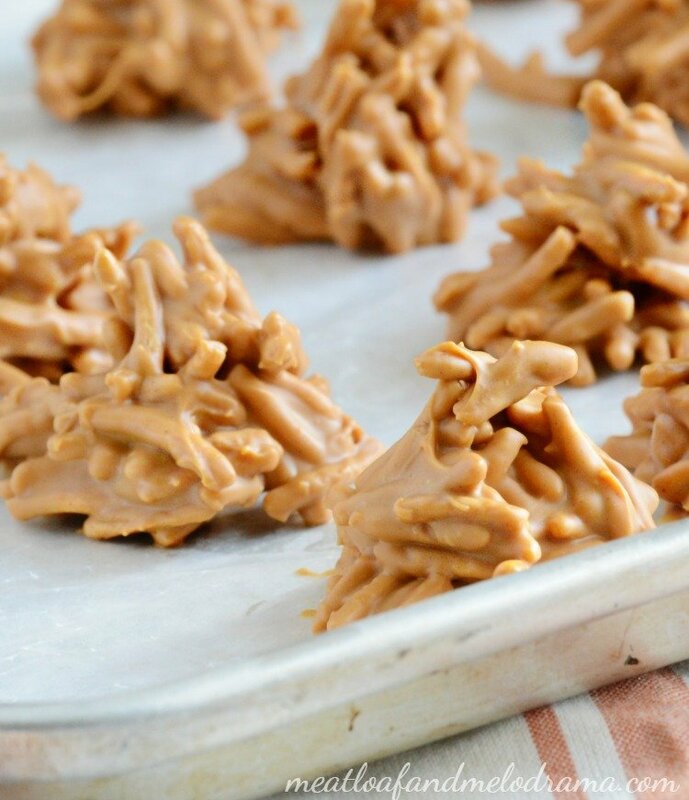 Your Butterscotch Haystacks are a perfect treat for fall. Thanks so much for sharing with us at Full Plate Thursday this week. Hope you have a fantastic week and come back real soon! They are fantastic candy… they’ve been my favorite since I was young. In my family, the haystacks are Christmas candy. I include them in my candy gifts for the neighbors and coworkers. These are too cute! I love the little pumpkin accent! These are ao cute for fall. Can they be made without the peanut butter?